The chilling fact is that there are no indicatives of risk before the condition presents itself. Risk factors can be found accidentally. At the moment of initiation, both types of strokes exhibit the same patterns. These patters can be observed by the sufferers and most important, by the people nearby. Thus, it is essential to know how strokes present themselves in order to decrease the time of manifestation! Headache is probably the immediate reaction a person has in situations like this. A sudden sharp headache, relatively impervious to painkillers. The headache is a response to the damage done to the surrounding tissue. In case of an ischemic attack(blocked blood flow), lack of nutriments makes the neurons slowly die. I don't want to be harsh, but this best describes the case. They die, one after another, slowly, as the cell supply is depleted. This loss is interpreted by the brain as pain. Along that, because the blood vessel is obstructed, it can increase in volume, itself compressing on other cells or-most importantly-the meninges. The meninges are conjunctive sheaths that cover the brain and spinal cord. They serve many purposes, ranging from protection to nutrition, Compression of the meninges is also perceived by pain. Is the case of a hemorrhagic attack(spillage of blood), it compresses the neurons and the meninges, causing the pain sensation. This pressure also crushes the neurons, killing them. This increases the pain signal. Now that we got the anatomy and physiology sorted out, let's pay attention to a factor that is neglected way to often: personal perception of pain. Pain is relative. It varies with the quantity of receptors, with the brain's wiring and so on. But it also can vary according to the victim's experience. Trained fighters have a higher pain tolerance, sensing less pain to a particular stimulus compared to the normal human being. This can be extremely serious, because if someone doesn't perceive pain at the intensity it should be, that person can not appreciate correctly the situation he's in. Also, because of the extremely high rate of occurrence of headaches, it has become our normal reaction to just shrug it off and hope it isn't nothing serious. 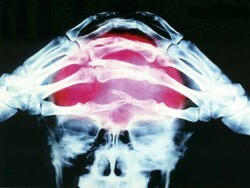 I am not suggesting you should start panicking at the first sign of a headache. What I am saying is that if you suddenly feel a sharp headache, without anything that would explain it(maybe you are a sufferer of cluster headaches, maybe you drank a bit more coffee than you should have etc. ), than maybe it would be better if you got that looked after. The problem with knowing these things is that it can come back at you. For instance, everytime I get a headache my mind will start racing and think of the possibility of the stroke. It can be ridiculous sometimes. Sometimes, my mind can go a little step forward, and make me THINK that my hand feels funny or that my leg jerks a little bit. And especially because headaches are extremely common, I get to think about what would it be if I were to have an accident like that. This problem usually accompanies the headache. It can happen even before it, it can be caused by it, or it can have the same cause as the headache. This problem is not as frequent as the headache. There are cases in which victims have difficulties seeing, just as easily as other victims see fine. The blindness can resemble a tunnel vision, in which the diameter slowly decreases, or can be like a random blotch, growing in size. Apart from some cases, in which the blindness is very rapid or total(indicating a big leak or a big vessel that was blocked), visual problems usually evolves at a fairly constant rate, allowing the person in cause to make measures. If the stroke happens in the area of the optic nerves(carrying impulses from the eyes to the brain) or in the optic chiasm(area in which the optic nerves cross each other, exchanging at the same time some information), there is bound to be ocular involvement. Also, it can happen in the occipital lobe, the part in the brain situated at the back of the head, area specialized in processing the information from the eyes. If there is a stroke there, there will be visual damages, despite of the fact that the nerves are intact.The person is thus "cortically blind". Moreover, a CVA in that area can cause a syndrome called "Anton-Babinsky syndrome". In this syndrome, the person(being blind) claims adamantly that he is not blind, and starts confabulating, trying to provide reasons for the clumsiness observed by others. If not seen with a careful eye(It's a joke, see? Eyesight problems, careful eye? ), this condition can develop for some time(not much, though) until someone realizes that the person in cause if definitely blind. This lost time can hinder the success rate of the treatment. If the victim realizes that his/hers eyesight is starting to depreciate, it should be an early indicator that a stroke is creeping in. Early discovery can lead to early treatment, with maximal recovery, depending of the state. I remember one occasion when I was at the gym and I tried a supplement. It was a vasodilator(an agent that increases the diameter of a blood vessel) that helped increase the blood supply to the muscles. What I didn't take into consideration was that the effect in cause did not discriminate blood vessels from the muscles from other blood vessels. The result was an increase in blood vessels everywhere. I saw superficial veins becoming more visible. And then I couldn't see them increasing in side, on the fact that I started to not see. I don't know if my black-out happened because of the pressure in the blood vessels in the brain or because the increase in volume determined a drop in blood pressure, which prevented blood from irrigating my brain properly. Either way, I got to know its effects, and I understood, at least for little time, what devastating effect can have the loss of vision, even if for a couple of seconds. This one can be a little subtle. As you can understand, speech impediments can be observed only when the person is speaking. If the bleed or ischemia happens slowly, speech impediment can occur first and it may take some time until other symptoms are exhibited. So, precious time can be lost if the speech impediment is not observed at time. Now, there isn't nothing much to do-you can't expect talking all the time. Symptoms may arise when you're sleeping, when you're supposed to be quiet and so on. But if you see someone struggling to speak, you know that that person is most certainly having a stroke and you can save a lot of time, time that can make the difference between levels of degeneration. One thing that can happen due to a stroke is a condition called aphasia. In this condition, the sufferer has problem either with writing, speaking or understanding what he's being told. In rare occasions, they can all present themselves simultaneously. This is extremely important in the case that you are the unlucky recipient of a cerebral vascular attack, in the sense that you may think what you're saying is normal, but in reality isn't. Anyway, recognizing speaking problems is ultimately based on luck. As said previously, you may not be near someone or you may also not notice your problems. But if you are near other people or you understand your situation, you can have more chances arresting the situation with as little damage as possible. One of the most compelling effect of a cerebral vascular attack is the sudden drop of half of the face corresponding to the opposing side of the brain. This condition is called "Face Drooping" and the intensity of the visual effect can vary. That said, if the right hemisphere is damaged, the signs will be present on the left half of the face. This happens because, as nerve cells die, they can't send motion impulses to the side of the face. The nerve in question here is the facial nerve. If the neurons connecting with it are damaged, the impulses will not arrive to the face. This causes the muscles in the face to relax. Also, the muscles on the other half of the face, contracting normally, will now drag the face on their side. Also, the person has problems closing the eye on the affected part, has trouble speaking and can't make forehead creases on the affected side of the face. The test for arm drift is performed when someone raises his/hers hands parallel to the ground. It is positive when the position can't be maintained. This indicates that motor function has been lost, being an early indicative of an acute cerebral problem. Usually, this symptom is observed firstly by the victim, when performing activities has suddenly become extremely problematic. Bystanders can observe this thing too, generally because loss of motor function in hands and arms is connected with loss of motor function i the legs. Thus, the victim will have a specific gait. Feeling you just lost control over half of your body must be terrible. So you need to keep in mind that people who get to experience this are extremely frightened and hard to deal with. If you see someone exhibiting this symptom, be sure to make all the appropriate measures so that the victim will be taken care of as soon as possible. If God forbid you find yourself in this situation, try to remain as calm as possible and alert those around you of your state. There is one area in the brain, which stroke diminishes the survival rate to 5% ! It is called the circle of Willis, and is a place where several arteries come together and branch away afterwards. It is a notoriously difficult area to operate upon, and even with the surgery, chances don't look that high. Really informative and engaging work. They call stroke the silent killer!